TORONTO—Irene Widdup is a dance evangelist, her life a mission to spread the joy of dance. It’s a passion that has earned her a long list of accomplishments and made her an influential member of Canada’s dance community. Mrs. Widdup is president of the Alberta Dance Educators Association, owner and artistic director of a dance academy in Alberta, and an accomplished dancer and choreographer. Her husband, Grant Widdup, likely knows her passion for dance better than anyone. That might explain why he flew her to Toronto all the way from Edmonton to see Shen Yun Performing Arts Thursday evening at the Sony Centre. “My wife had wanted to see the Shen Yun show and so for Christmas I got her tickets and we made arrangements to come out to Toronto to attend the show,” he said. To see the synchronization, just the detail and the 100 percent commitment from each dancer was amazing. Mrs. Widdup shared her thoughts on the performance during the intermission. 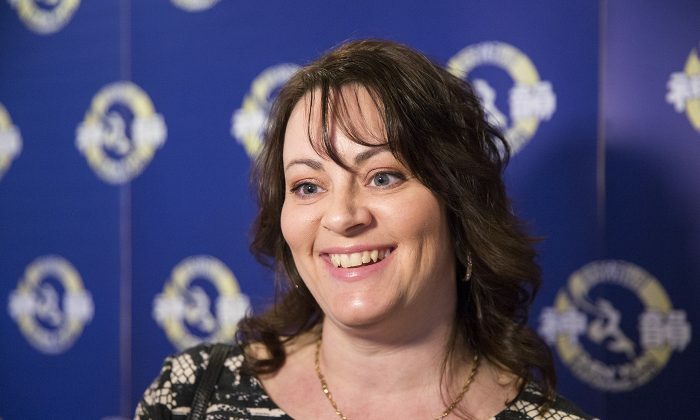 She’d seen Shen Yun before in Edmonton and loved it so much that she has been involved with a committee of people working to bring the performance back to Alberta. Shen Yun was unable to perform there after two provincially owned theatres instituted a policy to require a net over the orchestra pit. Shen Yun said that net makes it difficult for the orchestra to properly synchronize with the dancers and the digitally projected backdrop. “We’re truly enjoying the performance. It’s been a wonderful experience. It’s good to see all of the different cultural aspects of China,” Mrs. Widdup said. “I am fascinated by the way they walk across the stage. It just looks like they are floating across,” she said. In classical Chinese dance, the female dancers move with a rapid heel-to-toe mini-step, appearing as if they are gliding across the stage. “The movement is so quick and smooth that it makes the dancers seem as if floating on a cloud,” explains the Shen Yun website. Mrs. Widdup also appreciated Shen Yun’s efforts to revive traditional Chinese culture. She said it was important to share China’s long historical culture. Shen Yun was founded on a mission to revive 5,000 years of divinely inspired Chinese civilization. It is a cultural heritage rooted in China’s three religions of Confucianism, Buddhism, and Daoism, and the values carried down through the generations through those traditions. The values brought forward in the performance are important, Mrs. Widdup said. Gaining a better understanding of Chinese civilization through the performance was also beneficial, she said. Mrs. Widdup understands well the dedication it takes to stage a performance of Shen Yun’s calibre. She has trained with top teachers from the Royal Academy of Dance from London, England, and has also trained dancers who have been accepted into Canada’s National Ballet School, as well as students who have become professional dancers all over the world. She has won choreography awards and choreographed for events such as the 2001 Special Olympics World Games. She also performed with the Alberta Ballet at the opening ceremonies of the Calgary Olympics in 1988. These days, dance education is a priority for her, and helping others teach dance. She’s created educational dance materials that have sold worldwide and published a teacher training program called S.T.E.P. (Student Teacher Education Program) to help dance schools train their dancers. Her expertise has seen her invited to many conventions to share her curriculum and innovative style of teaching. One of the aspects of the performance that stood out to her was how well the large group of dancers performed together. She also appreciated Shen Yun’s orchestra, which includes traditional Chinese instruments leading the melodies with Western instruments serving as the foundation. That computerization is Shen Yun’s digitally projected backdrop, which provides vividly animated settings for each dance. “I’m really hoping that we can bring back this wonderful production back to Western Canada,” she said.